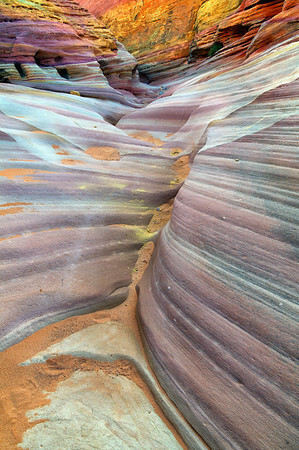 A mini slot canyon near the Fire Wave at Valley of Fire. I just loved this place in the early morning light and can't thank my good buddy, David Thompson enough for being the first to show it to me. The night before we had some killer light for our sunset shots, but on this morning the clear skies really helped the sunlight bounce off the walls. This is just the entrance and there are some really sweet comps to be had in this little canyon. And yes, it does look a bit like Rainbow Sherbert all over this place.